"The Titans of Tomorrow... Today!" Part 2 - "Beat Yourself Up"
The Justice League is being held captive in Titan's Lair, home of the original Teen Titans. 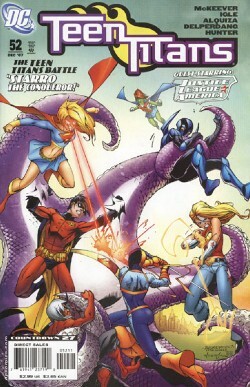 The current Teen Titans, meanwhile, are busy battling various villains under the control of Starro *and* future versions of themselves (except for Kara, who is battling with a future version of Conner) that seem to want to get the Titans of the present to be more violent and to kill their enemies. Blue Beetle frees the Justice League, who immediately leave as they're needed at the Watchtower for... something. Then Lex Luthor shows up in his battle suit with a whole mess of former Titans in tow. Story - 3: Man, I have no idea what's going on. Don't you just love picking up a story in the middle? So future versions of the Titans (or some of them, anyway... why no future Kara?) traveled to the past to get the current Titans to be more violent and/or use lethal force. But wouldn't that then change the past of the very same Future Titans, thus negating them from existence? What's the purpose of this? Are we supposed to know yet? And what the heck is Lex doing leading a mixture of heroes and villains? Art - 4: Pretty good. Kara's skirt was of decent length and there was good use of texture and expressions. And, apparently, the Superman in this book has Brandon Routh's shorts. Enjoyable art, even if nothing really blew me away. Nothing really stuck out as terrible, though, which is good. Cover Art - 3: I like the action here, it looks like a lot of fun. And I'm not going to ding it any points because the Titans didn't actually battle Starro within. Nah, it could be metaphoric, sure, they're fighting the little tiny Starro's on people's faces (but really, do we have to keep seeing Starro? STARRO? If there was one idea that should have been left in the past, besides the Super-pets, it's Starro). The problem is most of the issue had absolutely nothing to do with Starro at ALL, as it was focused on the Future Titans and their pseudo-evilosity. Still a fun cover, just misleading.